The United States has one of the largest wind energy markets in the world. Wind power development in the country has been largely supported through a production tax credit which allows producers to be paid based on the amount of electricity they produce through wind sources. However, uncertainty about the market and the future of subsidies or other tax benefits may hinder market growth in coming years. In 2017, wind power was the largest non-hydroelectric renewable energy source in the United States. The country generated about 254 terawatt hours of wind power that year. With a global market share of around 12 percent, General Electric was one of the leading wind turbine manufacturer in 2016. In the fiscal year of 2017, the U.S.-based company generated revenue of around 10.3 billion U.S. dollars from its renewable energy segment. 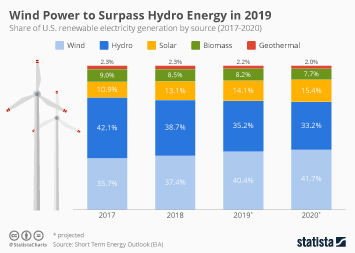 As of 2017, project developers have reported approximately 28.7 megawatts of wind capacity that was under construction or in advanced development. The United States continues to increase the country's wind power capacity, with Texas having one of the highest installed capacities. The California-based electricity supplier owns and operates Alta Wind Energy Center, one of the largest wind power projects in the United States. U.S. wind power capacity additions reached approximately 7 gigawatts in 2017. Cumulative installed wind power capacity in the U.S.
More interesting topics from the industry "Renewable Energy"